If you want to use Oasis again store it in water. If it is allowed to dry out it will not absorb the water properly the next time it is used. To keep plants watered whilst you are away for a few days, place one end of a pipe cleaner into the soil by the plant and the other end into some water. The pipe cleaner will gradually draw up the water. To keep plants alive during a longer stay away. Place a towel in the bottom of the bath and add 1" of water. Place house plants on top of the towel. They will draw up the water whilst you are away. Don't buy roses in tight bud as the chances are they will not open. Buds should be unfurling slight. Spray dried flowers with hair lacquer to prevent them dropping. To fluff up dried roses, hold rose head over a steaming kettle and gently tease out petals. To remove dust from silk flowers, put some table salt into a paper bag, put flower heads into back and shake vigorously. Remove flower from bag and it will be dust free. Poppies keep longer if you singe the stems over a naked candle flame. To revive dropping tulips or roses, wrap tightly in newspaper and put into water up to their necks. Leave overnight. If your roses are wilting, cut 1cm off stem, wrap in paper, plunge stems into boiling water for approximately 10 seconds, then put into deep cold water. 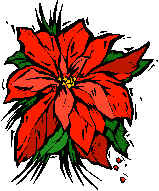 The sap of the Euphorbia (of which the poinsetta is one) is an irritant - always remember to wash hands after handling. Don't place flowers in direct sunlight, over radiators or on top of television sets. Keep in a well ventilated part of the room out of direct sunlight. Don't place flowers next to fruit as fruit gives off a gas which prematurely ages flowers. Remove dead flowers as these also give off gases which affect the others. 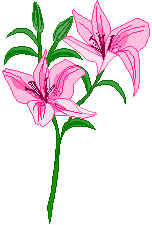 Lily stamens should be removed as soon as the bloom is sufficiently open as the pollen can damage fabric and polished wood surfaces. If the flower head is too heavy and the stem is hollow, put a garden cane up inside the stem to support bloom. To help when repotting plants into larger pots, place the current pot into the larger pot and push compost firmly into the gap between the two. Gently remove the inner pot which leaves the correct size hole into which the plant can be dropped. By accident I was wiping dust from a plant with a wet sponge containing fabric softener. Not only did the plant shine for about 8 weeks, it smelt wonderful. Thanks to Grace Galton for sending in this one. To make tulips stay upright poke a pin through the stem just below the head.